The "definitive" edition of the Wii U original lives up to its name by packing in every piece of previously-released content. Developed by Koei Tecmo, Ltd. Although we’re not very far removed from Retro Studios’ Donkey Kong Country: Tropical Freeze finding a new lease on life on Nintendo’s latest home console, the House of Mario isn’t quite done with reviving previous titles by moving them to its newest hardware. In the case of this game, the Nintendo Switch release of Hyrule Warriors: Definitive Edition marks the third time that the 2014 Wii U original has been released on a new device. Chances are that this version of the game will reach a whole new audience because of its latest iteration on Nintendo’s home console/handheld hybrid, but if you’ve made this detour within the Legend of Zelda franchise once or twice before, is it worth making another trip to see what’s been added for its latest bow? Packing in an obscene amount of content from the history of the Legend of Zelda series, Hyrule Warriors: Definitive Edition is clearly the champion when it comes to presenting the best value on that basis alone. Hyrule Warriors was originally released in North America for Wii U in September of 2014, developed by Omega Force and Team Ninja, and co-published by Koei Tecmo and Nintendo. A mash-up of Nintendo’s Legend of Zelda series with Koei Tecmo’s Musougame series Dynasty Warriors, this game puts you in control of some of Zelda’s most popular characters in order to face down armies that are thousands of soldiers strong. While you, the player, are ludicrously outnumbered by your enemies, the thrill of Musougames is that your level of power outnumbers even the combined might of thousands of enemy soldiers. This results in Link being able to single-handedly destroy legions of adversaries, all with relatively simple button combinations. Contrary to what you may have heard, Hyrule Warriors is not simply a Dynasty Warriorsgame with a Zelda “skin.” The thing that has kept players coming back for the past four years is the fact that it very much embodies longtime traits of the Zelda series, adopting weapons, game modes, themes, light mechanics, and a very authentic feel from the series that inspires it. While this is still outside the bounds of traditional Zelda titles in terms of how it plays, Hyrule Warriors is very much a love-letter to the series at-large, which makes it an easy recommendation for people who have more time logged with the Hyrule part of the title than the Warriors part. In addition to the advantages of the Switch hardware itself, this version of the game features better performance, a noticeable visual upgrade, and the inclusion of some content from The Legend of Zelda: Breath of the Wild. Originally just a female version of main series protagonist Link, Linkle became a popular character in her own right, and also makes for one of the more powerful players in the entirety of the Hyrule Warriors offering. They also added a new epilogue to the existing story mode based around the characters and situations of The Legend of Zelda: The Wind Waker, giving you control over: Toon Link, the King of Red Lions, and the pirate leader Tetra. This very much acted as a crowd-pleaser due to the immense goodwill that The Wind Waker has in the Zelda fanbase. Beyond these additions, the 3DS version also included all of the previously-released Wii U DLC content, a couple of new characters, and some new mechanics. On Switch, Hyrule Warriors: Definitive Edition includes all the additional content included in the Legends release, but brings even more to the table by including additional costumes (some of which are inspired by The Legend of Zelda: Breath of the Wild), a couple of minor gameplay tweaks, as well as a notable graphical and performance boost that will be immediately apparent to anyone who’s played the Wii U version. Of course, on top of those new features come the abilities granted by the Switch platform itself, including the ability to play this version of the game on the go, in addition to the introduction of split-screen multiplayer that you can play with a friend on two Joy-Con controllers. In terms of its completeness, Hyrule Warriors: Definitive Edition more than lives up to its title. What about the actual game, though? Acting as something of an "Elseworlds" story, the Hyrule Warriors narrative mashes together characters from Ocarina of Time, Twilight Princess, and Skyward Sword to tell a multiverse-spanning tale of cosmic peril. 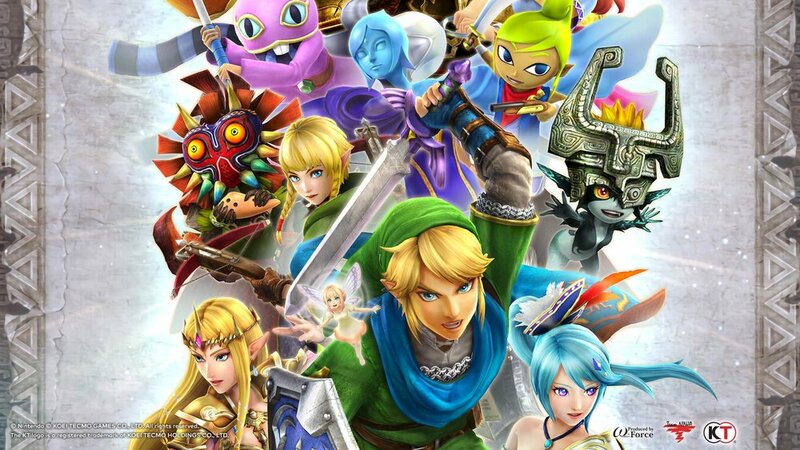 It’s not easy to mash together a bunch of different Zelda games into a single experience, but one of the ways that Hyrule Warriors succeeds – regardless of platform – is the way it unifies sometimes wildly different aesthetics from past Zelda titles in order to make all of the characters function flawlessly within this single game. Omega Force and Team Ninja very clearly have a lot of affection for The Legend of Zelda, and it shows because of how authentically it recreates several iconic locales, and how it brings in the series’ most iconic characters. It may be a little jarring in some scenarios to see Midna fighting alongside Skull Kid, for instance, but all of the ways the major characters have been interpreted under the umbrella of the Hyrule Warriors art style makes for an overriding feeling of genuine thrill for series fans. This is definitely Midna, that is definitely Skull Kid, and we’re absolutelyfighting for the future of existence. The essence of specific characters and environments all help to add to the overriding authenticity, making this experience the closest you can get to being a Zelda game without actually being anything resembling a traditional Zeldaexperience. Yeah, that sounds weird, but against all odds it’s true. When it comes to the story being told here, it’s everything that it needs to be. As most gamers and Nintendo fans are all too aware, trying to make any sense of the official “timeline” of the Legend of Zelda series is a migraine waiting to happen. Things across one game may entirely contradict the occurrences in another; the actual times in which the games take place are about as far from sequential as you can get, and even connected games have characters or situations in them that make you wonder howanything in this series can possibly be connected to each other. The key to understanding the Zelda timeline is a word in the series’ title: Legend. Legends in the real world all too often contradict each other, with only a certain set of rules tying them together, because they’re… well, legends! The true occurrences are often lost to the sands of time and making some kind of chronological sense of everything is, in and of itself, a maddening exercise even for academic scholars. Hyrule Warriors solves this problem by having its story take place outside the established canon of the series, offering an excuse for characters who either wouldn’t, or shouldn’t, combine their forces in order to make sure that the fabric of reality itself is saved. While the story makes reference to the larger cyclical events that tie all of the games together to some degree, it grasps that familiar Zelda baseline of events and uses it to tell an appropriately reality-shattering story that requires heroes and villains from fragmented timelines (specifically The Ocarina of Time, Twilight Princess, and Skyward Sword) to come together to save their collective existence. If you’ve ever wanted to absorb a massive Zelda-themed crossover “crisis” that would put even the most grandiose comic books – the Civil Wars or Flashpoints – to shame, look no further than Hyrule Warriors. On top of that, the amount of extra story content makes the Switch’s Definitive Edition the best place to play it. Although the story is fun and the gameplay is addictive, Hyrule Warriors will undoubtedly feel repetitive to some. Still, coming in such an entertaining package counts for a lot. Although Hyrule Warriors has more Zelda themes packed into it than a Twilight PrincessGiant’s wallet has rupees, playing the game will make clear just how little Zelda gameplay there is to find here. By and large, Legend of Zelda as a video game series is carefully composed, with the game’s puzzle-solving, traversal, combat and story all coalescing into a series of games that manages to totally define the generation in which a specific entry is released. That careful planning and meticulous attention to detail in every aspect of the experience is what makes Zelda games both so beloved, and often universally praised whenever a new one comes out. Hyrule Warriors, on any platform, stands as a stark contrast to traditional Zelda gameplay by having far more in common with the off-the-wall bombast of the most ‘roided out action scene in a Michael Bay film. As a single character, you stand against thousands of enemies on sweeping battlefields, and those sheer numbers do nothing to offset just how much power you have on each board of the game. The core element when playingHyrule Warriors on any of its platforms rests in the prime combat scenario: you versus thousands, and none of them stand a chance. This is the where the chief complaint about the game rests, because while these combat encounters feel empowering, they’re also extraordinarily repetitive. It’s true that this is something of a hallmark for Dynasty Warriors, but it still works against this game and its replayability. It seems that the developers knew this, though, and although the combat is the main event of the experience, there are other modes that help to make this detour to an alternate Hyrule a more than worthy journey to go on. The game features an “Adventure Mode,” which scatters enemies and hidden unlockables across familiar Legend of Zelda series overworld maps. The first is taken straight from the original 1987 NES game, with other maps inspired by the likes of The Wind Waker,Twilight Princess, Majora’s Mask, and A Link Between Worlds. This is where you’ll be able to find most of the higher-level weapons that appear in the game, in addition to a whole plethora of playable characters that you can unlock for use in either this Adventure Mode or “Free Mode,” which allows you to replay any of the story-based battles using any combination of characters you’ve already unlocked. Want to take on King Dodongo with the might of the Demon King himself, Ganondorf? That’s what this mode is for. 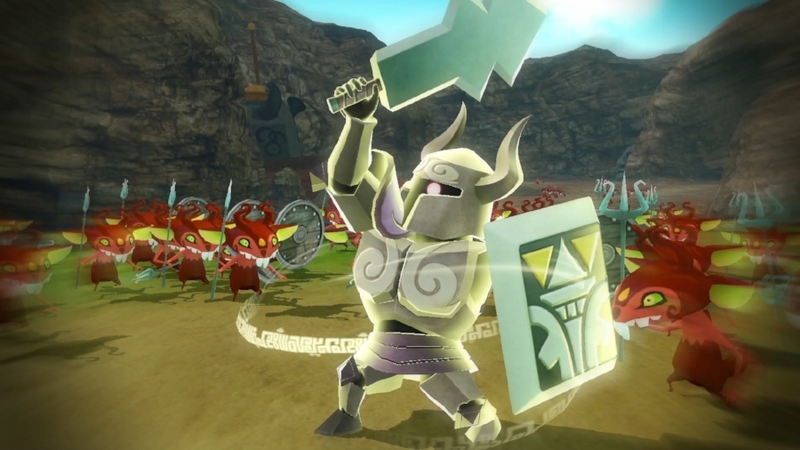 There are other modes, including an optional Ganon-centric one that allows you to unleash the full power of the series’ primary antagonist in a number of different ways, and the “My Fairy” feature makes its return from the 3DS version to allow you to bring different buffs to your characters that you can take into a battle scenario. Still, even on top of the Adventure Mode, the story mode, the gear customization options (which are almost too in-depth to even graze in this format), and the additional content added, the crux of the gameplay is still the combat: Hyrule Warriors’ best and worst attribute. It’s hard to ignore the sense of fun you get while playing it, but as time goes on, it’s also hard to forget it’s repetition. If you’ve never played this Musou/Zelda mash-up before and are looking for the easiest path to entry, you’ll most certainly find it in Hyrule Warriors: Definitive Edition on the Nintendo Switch. The additions of all previously-released DLC content along with a few new surprises, the increase in graphical fidelity, performance, and the feature-sets of the Swfitch itself, clearly make this the best place to play this interesting experiment of aZelda spin-off title. However, if you find yourself being more of a fan of the Hyrule side of the title over theWarriors part, it becomes clear that this kind of bombastic, over-the-top combat may not exactly be what you’re looking for. By that same token, if you’re a fan of the characters and find yourself longing to actually be thrown into one of those mythologized battles that the characters in Zelda games often speak about in tones of hushed reverence, you’ll likely find something that’s immensely enjoyable, albeit in small doses. The unlockables strewn throughout the Adventure maps leave plenty of stones for you to overturn, for new weapons and characters, and if you are a series fan, then a game type you may have never thought you’d ever play may be significantly more enticing for you if these are the characters you’re playing it with. If you’ve got a Zelda itch to scratch with a small side of bloodthirst, then there’s no question: you’ll likely have a lot of fun with Hyrule Warriors: Definitive Edition on the Nintendo Switch. This review originally appeared on GeeksAndGamers.com.